Remember, the basic distinction between logos and rhema made by those who would have us believe there is something significant in the difference, is that rhema refers to that which is spoken and logos refers to that which is written. While that basic distinction, in and of itself is not a problem, it is the way it is carried to other thoughts that tends toward deception. I will tell you straight up without equivocation that is a lie straight from the pit of hell. No matter what the context of the statement, or the supposed meaning or purpose, it is a lie designed to get you away from the Word of God. There is a true principle about using the Bible without the Spirit which ends up in ministering death; and I am sure that is what most folks mean whenever they say such things about the letter killing. However, Hebrews uses logos and Ephesians uses rhema. It is here where the distinction is made. Ephesians is talking about the “whole armor of God” as a necessity in our spiritual warfare. Taking a cue from Matt. 4:4 where Jesus said, “It is written…,” the thought is that the “word of God” here is the verse(s) the Holy Spirit brings to you in the moment of warfare. 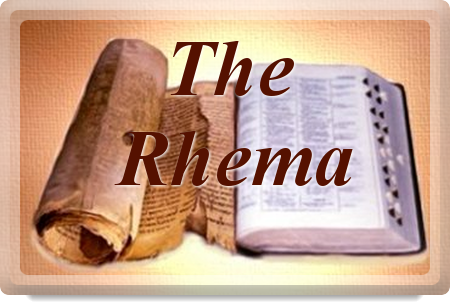 The significance of rhema (as distinct from logos) is exemplified in the injunction to take "the sword of the Spirit, which is the word of God," Eph 6:17; here the reference is not to the whole Bible as such, but to the individual scripture which the Spirit brings to our remembrance for use in time of need, a prerequisite being the regular storing of the mind with Scripture. Again, there is nothing here to throw stones at. However, the further removed we are from the teaching of this truth, the more we have seen the error creep in. ...a prerequisite being the regular storing of the mind with Scripture. What is said now is that whatever rhema word you get from the Lord cannot be against the scripture. Plainly, what Mr. Vine was saying is that the rhema you get in the moment of ‘now’ will be that which has been stored up within your mind/heart/spirit from the logos. Is that not what Jesus said also? Let’s now begin to look at some of the places these two words are used in the NT. The writer used logos for the spoken word. Instead of saying that those who were used to record God’s Word messed up, would it not be possible, and actually more likely, that maybe we are messed up?